From first ball, I instantly connected with the ball motion. Clean and smooth down lane. I love the solid color. Then I thought, is this fresh pattern right for this ball? More on that later. Intent: Low flaring, get into a quick roll with a quick transition at the breakpoint. This type of layout usually creates a smooth boomy move down lane. 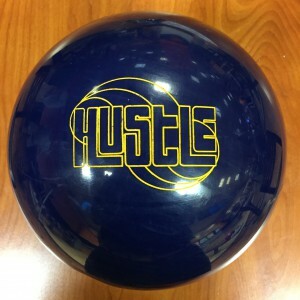 Buy the Roto Grip Hustle Ink at PerfactAimBowling.com. 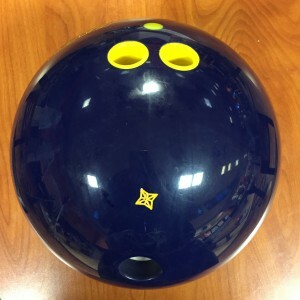 The Roto Grip Hustle Ink is a lower priced performance bowling ball so it offers decent value. Since value comes down to usability, it’s going to need some friction or break down to perform at its peak. The Hustle Ink uses the Hustle™ Core with the Thrilled™ polished solid coverstock. As mentioned, right out of the gate, I did love the Hustle Ink ball motion. I was taken aback when I tested the WreckEm and realized how strong it is, somewhat expecting a weaker ball. The Hustle Ink is that ball. It has a moderate core with a low differential which makes it very smooth. Then it’s wrapped in a not very aggressive solid coverstock that’s polished. This allows for a very predictable and smooth motion. What I quickly come to realize is that the fresh medium condition is actually a bit too much for this ball. 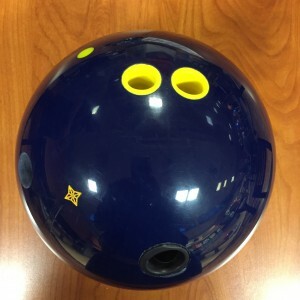 Then I was excited to think that there is finally a ball that is a true dry lane ball that isn’t urethane. I had a similar thought with the Match Up and Match Up Pearl but the Hustle is definitely a step down which fills a hole. We always test on a fresh pattern and so we gave it a go. However, I quickly realized this ball was not the happiest out of box on a fresh shot. It was easy to get to the pocket but left several corner pins so we stopped the test. We decided to actually come back to testing this ball after we had tested the Show Off and No Rules Exist to allow for some pattern breakdown. That’s when it came to life in terms of carry. For me, I have liked shiny solids in this level of ball motion because you get a smoother shape but still some punch. The ball certainly clears very easily, you don’t have to fight it. Then it starts to make a smooth move when it sees friction, unlike many low end balls that typically use pearl and are very flippy off the dry boards. Again, a consistent theme of predictability. I tested the Hustle Ink vs the Wreck Em and the Wreck Em always has a punchy move downlane, never looking “lazy”. Whereas the Hustle Ink is smoother and need more friction to create that punch. Greg had the same ball reaction, no surprises. It almost looks lazy off the dry but not urethane lazy. That’s why we liked the ball motion. With miss room, you can see it with both strikes and non-strikes. The ball seems to have a progressive reaction depending on how much friction it sees. Meaning when you miss in, it slowly makes its move and holds. When you miss out, there’s lots of friction and it comes roaring back. That’s the type of ball you want to see on a house shot but I personally would have liked to see this blend the pattern just a bit better. For me it was better to miss out because of my low tilt, the ball really stands up too strong on misses in. For Greg with medium tilt, he could still get it to go through the breakpoint and not turn enough, with the 2-8-10 type leaves. In the end, I’m pleased to see this type of ball motion with the Roto Grip Hustle Ink. While this could be an entry level ball, I really think it’s designed as a step down ball for an arsenal. One that will let you go to the bottom of the arsenal while not quite reaching for urethane. There were times where I thought it needed to be more punchy to snap out the corners (fresh) and times where I felt it was reacting too hard to dry (broken down). Given that it’s clear this is a ball for breakdown, I would probably surface this to 4000 and get a smoother reaction that I would like to see. Love the solid dark color. All in all, good effort from Roto Grip.